The machine labelled a 16/32 Bit Personal Notebook Computer was a revolutionary mix between an STE and MEGA STE with a 32-bit internal data bus, a 24-bit external address bus and a 16-bit data bus with a hard drive and mono monitor all contained in one sleek package. Announced July 1991, the ST Book is the size of an A4 sheet of paper and weighs just over four pounds (the Stacy weighed 15.2 pounds!). The price reflected the business orientation of the machine being over �1,200. In May 1992 Atari expected sales of up to 10,000 ST Books by the end of the year. It is unknown to me how many were actually sold, although if anyone knows, please email me! After the short battery life of the Stacy Atari cut power usage on the ST Book down to a minimal, basing the technology on the never released ST Pad. The Stacey's backlight used up to six watts whereas the ST Book's total consumption is only 1.25 watts. Another design decision to save power was the lack of an external monitor socket, so the machine can only run in Atari Hi-Res (640 * 400 in 2 Colours). There are a host of built in power saving features such as the hard drive powering down, when unaccessed for several minutes. A Video Saver routine updates the LCD from the LCD Control Chip rather than from the main RAM, until a system call is made to the screen. The Blank Screen feature switches off the LCD driver after a preset time, and Shutdown switches off the whole machine. When the machine is shutdown nothing is lost as it features Save and Resume, which brings you back to exactly where you were before shutdown. This works when you close the lid whilst in the middle of doing something. Even if the batteries fail, and you replace them the machine will still be able to restore your previous position for up to three months! Instead of using a mouse the ST Book used a Vector Pad, a vector sensitive disc set into the top right-hand corner of the keyboard with two buttons just below. The case a matt black with a distinctive rubbery texture, and the keyboard had 84 keys (rather than the STs standard 94), the numeric keypad is accessed by pressing the "Atari" key combined with certain keys on the keyboard which have the numeric values in blue. It is also possible to connect a Mega ST style keyboard, or external numeric keypad. 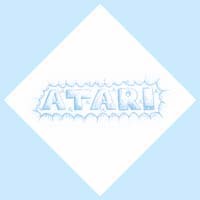 The keyboard was said to be better than the keyboard on an ST. Atari were aiming the ST Book at the MIDI music market, and initially advertised in music magazines, although it would be fine for all other Atari software that runs in Hi-Res. The ST Book didn't feature a floppy disk drive, although it was possible to connect one, through the non-standard Centronics style port on the back, although whether one was made for it or not, I don't know, but it was said that Atari did supply an optional external 1.44 floppy drive which ran from it's own batteries. But this wasn't a problem as file transfer software was built into it's ROM, and came on a floppy for the ST, it even came with the correct cable! The software runs much in the same way as Interlnk or Direct Cable Connection on the PC, as one machine is set as Master and one is set to Slave, although the transfer part is similar to that of a program such as Kobold or the shareware program Cheetah. The ST Book looked like it could have been expanded with a whole manner of things, with ports such as a 120-pin expansion connector, which with an adapter can work as a cartridge port. Atari also produced a MIDI expander which gave five extra ports and SMPTE compatability. Also included was a 10-pin keyboard connector, MIDI In and Out, the Floppy/DMA/ACSI (Hard Drive) connector, a Serial Port, the Standard Parallel port, and "A Mysterious Space"!!. Also there were Contrast and Volume controls on the side of the machine. The Basic pack that came with the ST book included seven alkaline AA batteries and a battery pack, the specially wired parallel cable (for file transfer), the software for that, a user manual and an applications software manual. Optional accessories included a mini MIDI cable, ACSI/DMA adapter for external hard drives, a NiCad battery pack, a portable 1.44 floppy drive, the previously mentioned MIDI adapter, and a carry bag. 208 mm x 259 mm x 24 mm for SONY VAIO of today!!! Another great product from Atari, who seem to be at the forefront of technology as anyone who knows anything about the MEGA STE, TT, Falcon, ST Book, Jaguar, Lynx etc will already know. Page created as I couldn't find any information about the ST Book on the internet, only information about the Stacy, so I thought I'd do my own! Source ST Format issue 34 May 1992 and ST Format issue 24 July 1991. I have not actually seen one myself, just the pictures, if you have one lying in your attic somewhere that you'd like to donate (or sell) to a student then please email me! If anyone knows any total sales figures for items such as the ST Book, Falcon, Mega STE, Atari TT etc then I would love to hear from you! The ST Book is currently top of my list of DREAM Machines!